It’s a new era in many ways for Hawai‘i’s public schools: a new superintendent, a new four-year teachers’ contract and a new school year with cooler classrooms on several islands. This issue focuses on how the governor, the Board of Education (BOE) and our new schools superintendent are working together to improve achievement for all students. TEAMWORK: BOE chair Lance Mizumoto and Governor Ige welcome Dr. Christina Kishimoto. Q: Why is this an important next stage for our public schools? A: I truly believe we’ll see the greatest improvement in student learning when schools feel empowered to innovate and take responsibility for the results. We need to change our system from a culture of compliance to one where schools feel their voice matters. They need to have access to resources to design what could work best for their students and their communities. With the new Every Student Succeeds Act (ESSA), the states have more authority to set their own priorities in public education. Under the former No Child Left Behind law, we had a decade of centralized, top-down decision-making. 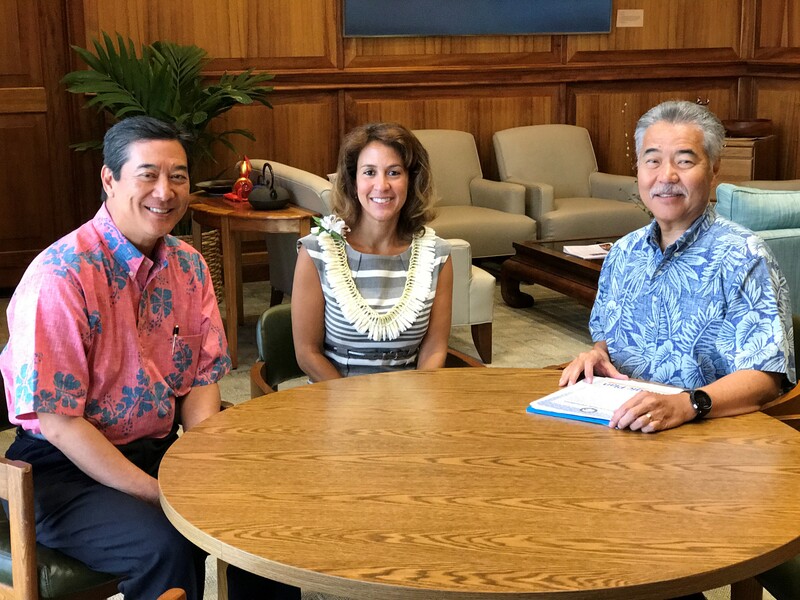 Now in Hawai‘i, we can move forward with new superintendent Dr. Christina Kishimoto, the BOE, and myself all on the same page. Q: Why do you believe Dr. Kishimoto a good fit for Hawai‘i? A: She shares many core values of those of us who grew up here and have children in the public school system. She understands that public education is the great equalizer and fundamentally important so all children can pursue their dreams. Dr. Kishimoto has a track record of closing student achievement gaps and a commitment to school empowerment. She intends to get out into communities to listen and learn, and I plan to go with her for several of those visits. Q: What progress are you seeing in “cooling the schools” and why did you get involved in the teacher contract negotiations? A: I’m encouraged that the DOE says it plans to meet my goal of 1,000 air conditioners in the state’s hottest classrooms by the end of August— and to do it in an energy-efficient way. I got involved in HSTA negotiations because they weren’t making progress. I told the union and management teams we had to get this done and that we needed to focus on those issues that were most important to get a settlement. The four-year contract means we can have some labor peace and focus on improving our schools. Q: Why are you encouraged by what you’re seeing in STEM (science, technology, engineering and math) school programs? A: We know the world is changing rapidly, and our students need to think critically, communicate effectively and be able to work with others. I’ve been so impressed with what our students and teachers are accomplishing in coding, robotics and related STEM fields. The Kualapu‘u robotics team on Moloka‘i is a great example (see story on Page 4).They were fearless in the 2017 VEX IQ international competition and excelled against teams from 30 other countries. The students are a tribute to their teachers and coaches and have shown how a community can take ownership of student achievement. This is how public education can help children achieve their dreams. We also want to nurture our local talent for future careers in Hawai‘i. Some of the best information tech jobs are right here in state government — in health care, human services, student information systems, our Office of Enterprise Technology Services and other agencies. We want our students to take advantage of these opportunities.